P023 Mucor, Sporangia & Hyphae, W.M. 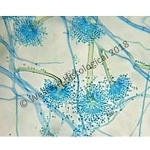 P026 Penicillium, Aspergillus & Rhizopus, W.M. P029 Cup Fungus, apothecium, V.S.